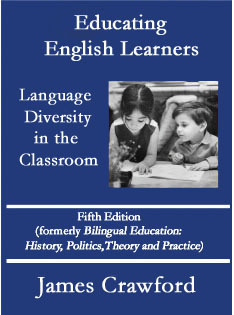 This best-selling introduction to language-minority education – formerly known as Bilingual Education: History, Politics, Theory and Practice – has been updated and expanded to incorporate the latest developments in research, pedagogy, legislation, and politics affecting English language learners. "By far the most complete, the most thorough, and the most insightful volume of its kind ever done in the field. After your payment is received, your Web browser will be redirected to a page with instructions on downloading and a password you will need to open the file. Please note that it is in Portable Document Format (PDF), which may be read on a personal computer, iPad, Nook, or other eBook reader. It may be converted to Kindle, but tables are not supported in older versions. By clicking on the PayPal link above, you agree not to make copies or reprints beyond the number of eBooks you have purchased. Also note that your purchase does not allow any electronic posting or other reproduction of the work on web sites, "electronic reserves," or similar media. Thanks for your cooperation in honoring this copyright agreement. To inquire about permission to reprint or repost portions of the book, please write to this address. Copyright © 1997-2012 by James Crawford. All rights reserved. Except where otherwise marked, material from this web site may not be republished in any form and for any purpose – including course use, electronic reserves, and Internet postings – except by permission of the author at this email address or via PayPal links on this site. SPECIAL NOTE TO STUDENTS: No permission is required to quote from or paraphrase articles from this site in term papers, dissertations, or other course work not intended for publication. Of course, appropriate bibliographical credit should be given to avoid plagiarism. For further information, see my permissions FAQ.